Given that I work in the field of Holocaust Education, I am often asked a great deal of “why” questions. Why did something as horrific as the Holocaust happen? Why did some survive and not others? Why were some people saviors and while others were bystanders? Why didn’t more Jews just leave? Why didn’t more people fight back? Why do we remember? Why do we educate? Why? Why? Why? It seems that we have infinitely more why’s than answers. 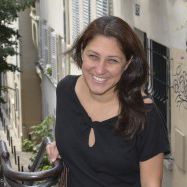 In the immediate weeks leading up to International Holocaust Remembrance Day, I found myself not only answering another “why” question but also questioning it myself. Each year, on January 27, the United Nations and the International community pause to remember and tell about the horrors of the Holocaust at the United Nations Commemoration. This date was chosen to coincide with the day that Auschwitz was liberated, January 27, 1945. 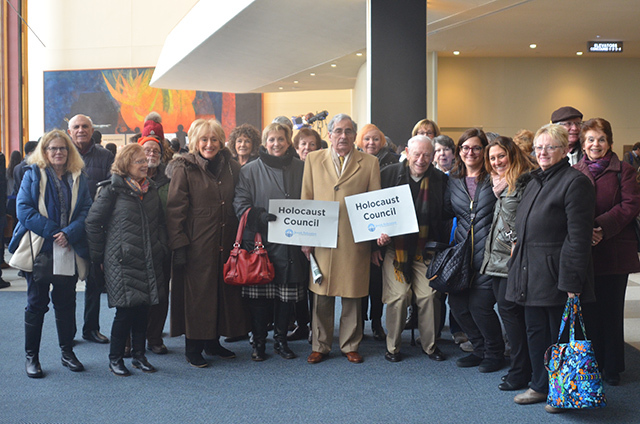 For many years, our Federation’s Holocaust Council has taken a delegation to the United Nations to participate. To be perfectly honest, it is not an easy day. For starters, January 27 is, of course, the heart of the winter. The day always seems to bring frigid temperatures and oftentimes snow or ice upon us. As many of our survivors are getting older, traveling into the New York City on a freezing winter day is never ideal. And you know how daunting traveling from New Jersey into the city on a weekday for an arrival time of 11 a.m. can be. Once we arrive at the United Nations, we have to keep our group together while we retrieve our tickets, wait on security lines, make our way to the General Assembly, and finally take our seats. From time of boarding a bus in West Orange, it’s a stressful two hours. For several years, the Holocaust Council has posed the “Why do we go to the United Nations?” question over and over again. Many have said that the day is not organized well by the United Nations, while others have said the journey is just too tough on a winter’s day. At times it’s hard to hear and there isn’t enough seating. So, as I began my new position as Director of Holocaust Education in the start of the new year, I had to make a decision quickly. I had attended the United Nations event several times before and I too saw the difficulties and roadblocks in the day. Yet when posed with answering this question, I was somewhat at a crossroads myself. And inevitably, after much debate, 74 years and one day after Auschwitz was liberated (since the date fell on a Sunday this year), the Holocaust Council of the Jewish Federation of Greater MetroWest arrived at the United Nations Commemoration with more than 40 adults, including survivors and children of survivors. It was cold, it was a little icy, and we hit traffic. There were lines to get through security. It was difficult to find seats. But by 11:05 a.m. we were all seated throughout the General Assembly and taking part in the two-hour United Nations Holocaust Commemoration. As I sat there, and listened to the survivors, the dignitaries, and the head of the United States Holocaust Museum and Memorial, I looked around the room. It was full, but it wasn’t standing room only as it has been in the past. There were survivors (but not nearly as many as previously) and there were a few students (not the mass delegations that have been there). And there was my answer to why. We need to show up. We need to let it be known that Holocaust Remembrance and Commemoration matters. As less and less survivors are here, and less and less people show up – we need to continue to do so. Back in 1948, just as the horrors of the Holocaust were coming out and when survivors were emerging from the ashes, the newly formed United Nations deemed genocide a crime under international law. The world was all ears at the time. Yet since then, we know there has been other genocides, we know that there has been Holocaust denial, and we know that many have stopped listening. So why show up? Because we should; because we need to show up. We should brave the cold and the ice and the traffic and the lines. Because they really aren’t that hard to manage — remember we made in just over two hours. I have my answer to why, and I know where I will be on January 27, 2020. I hope you will save the date and join me at the United Nations.